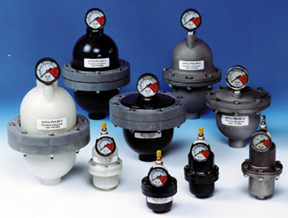 Like all metering pumps, diaphragm models are utilized in many industrial and commercial applications and lauded for their ability to provide consistent fluid input in order to maintain a homogenous process flow even through continuous use. With extremely high accuracy rates, exact amounts of liquid are pumped at predetermined intervals. Diaphragm Metering Pumps – Primary Fluid Systems Inc. This particular type of metering equipment is utilized in the daily operations of aerospace, marine, food and beverage processing, chemical, electronic, mining, petrochemical, material handling and transport, medical, construction, automotive and agricultural industries. The immense capabilities of these liquid meters is demonstrated by their use to transport thousands of gallons of crude oil and fuel while their precision is illustrated by their use in artificial hearts. Two techniques are used to actuate the stretching and contraction of the diaphragm, the source of displacement. Compressed air is used to stretch the membrane in pneumatic pumps, while other models employ a rod, piston or other mechanical device that is attached to the center of the film in order to push or pull it and change the volume of the adjacent chamber. Hydraulics may also be used and act similar to pneumatics but with the use of hydraulic fluid rather than air. No matter the actuator, the diaphragm pump is particularly popular as it is low maintenance, has few moving parts and is less prone to leaks than popular piston metering pumps due to the lack seals which are most often the source of leaks due to repeated friction and wear over time. The design of a positive displacement pump is integral to its success and accuracy. The diaphragm pump is relatively simple in design making it highly reliable. Most often, a single diaphragm is attached to the interior walls of a cylindrical chamber. Clamped or otherwise sealed, this creates an unmoving barrier between the actuating device and the fluid. At the opposite end of the cavity are inlet and outlet connections, both with check valves to ensure the proper flow directionality. When the membrane is retracted it increases the volume of the chamber, decreasing pressure and effectively creating a vacuum which draws a specified amount of fluid in through the inlet valve. Alternatively, stretching the diaphragm back down towards the fluid increases pressure and pushes the liquid out through the exhaust valve. Variable materials may be used for both the membrane and the housing which keeps it in place. Materials such as aluminum, stainless steel, cast iron, brass or bronze are used for the holder while ethylene propylene, rubber, plastic and other elastomers are common compositions for the membrane itself. Material selection is extremely important and must take into account the liquids that are to be pumped as they may include waters, oils, solvents, fuel, coolant and acids as well as other hazardous or even toxic materials. Abrasive fluids also require particularly durable diaphragm construction. Additional considerations for diaphragm pumps include maximum flow, maximum pressure discharge, inlet size, exhaust size, media, operating temperature and power source. Diaphragm Metering Pumps Diaphragm metering pumps employ flexible membranes to alter the volume of a controlled chamber in order to effectively displace fluids with accuracy and precision.